Tokyo and Osaka are the most popular travel destinations among international travelers. But how about considering Kusatsu Onsen (Kusatsu hot spring resort) in Gunma prefecture if you wish to visit other places in Japan? Along with Arima Onsen in Hyogo prefecture and Gero Onsen in Gifu prefecture, Kusatsu Onsen ranks as one of the three highest-quality hot springs that are loved also by the Japanese. In winter, snow fall in Kusatsu. 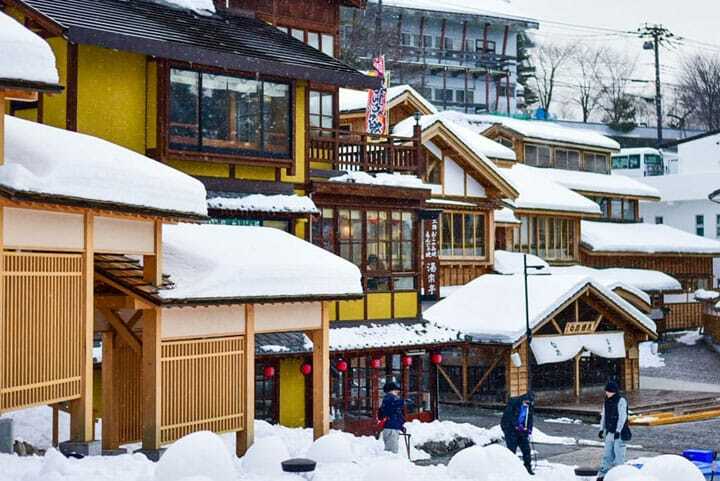 Travelers visit Kusatsu Onsen resort to view the landscape with snow, while soaking in a hot spring to get rid of their fatigue. In Kusatsu, in addition to hot spring resorts, Japanese-style houses and stores are found along a beautifully paved street which makes you feel amazing just by walking along it. Many thin layers of light snow are piled up like mille-feuille, covering the roofs. Although the day when we visited was sunny, we got to see one of the unique landscapes of Kusatsu, namely the “mille-feuille houses“ as there were some snow left on the roofs. When speaking of Kusatsu, everybody first thinks of Yubatake. Yubatake is located in the center of Kusatsu onsen. 4,000 litters of hot water comes from this source per minute. There are many souvenir stores available around Yubatake, an area which is always full of travelers. In the center of Kusatsu Onsen, there are free foot baths. They help getting you warm up immediately, no matter how cold it is outside. If the weather is good, how about walking around Yubatake? After strolling around Yubatake, we also walked to Shirane Shrine, which is located nearby. It is believed among locals that Kusatsu Onsen was founded by Yamato Takeru, the legendary price who appears in Japanese mythology. Loctaed in the heart of a grove, Shirane Shrine is dedicated to Yamato Takeru. The contrast between the trees standing strong against the cold and the white ground is stunning. Moreover, this place is the home of photinia, a plant whose pink flowers bloom at the beginning of May every year. On July 17th and 18th, a festival is held at Shirane Shrine, where the participants carry portable shrines around the town. In Japan, the substances contained by the hot spring water vary from place to place. Kusatsu Onsen has the highest output of healing hot spring water in the world. Its pH value is 2.1, which means it has an outstanding bactericidal component. As there are only 200 kilometers between Tokyo and Kusatsu, you can reach JR Naganohara-Kusatsuguchi Station in about two and a half hours if you take a limited express train from Ueno Station. You will get to the Kusatsu Onsen bus stop in about 25 minutes after taking a bus departing from the train station. Please take care not to buy a wrong bus ticket when taking the bus at Naganohara-Kusatsuguchi station. We highly recommend you check how to travel there in advance. Kusatsu Onsen - Japan's Best Hot Spring Resort For 10 Years! A Tour Around Izu Peninsula With a Thai Exchange Student. Beautiful Scenery, Delicious Food and Onsen! Kanagawa's Doppo no Yu: 9 Foot Baths To Ease Your Tired Feet!